Size of Male: 14-18 lbs., 10-11 in. Size of Female: 14-18 lbs., 10-11 in. 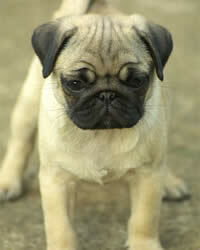 Visit our Pug dog names page. The Pug is a sociable dog that is more apt to sit in a lap than to play. These dogs are remarkably affectionate and they get along well with other animals as well as children. They can, however, become jealous. These little dogs are fairly easy to train and offer a stable temperament that makes them excellent companion animals. This breed is the only toy dog breed descended from the Mastiff family. The ancestry of these dogs has largely been lost, but many mastiff characteristics are still present. This breed has been popular in Asia for many centuries and was a favored pet among ancient Buddhist monasteries. This dog breed has been the official dog of the House of Orange since 1572, when one of these little dogs saved the life of Prince William. This breed gained AKC recognition in 1885 and is still a popular show dog and companion pet. These little dogs are good natured animals that are amiable and easy to get along with. While somewhat playful, they are often content to serve as a lapdog or companion. These dogs do well around strangers and children of any age. Like other breeds, however, they should be socialized around other dogs at an early age. Living Environment – This dog breed is an indoor dog as they do not adjust well to heat and humidity. These dogs are remarkably low maintenance and happy around other animals, making them well suited for families and for the elderly. They are also well suited for apartment buildings. Grooming – This breed requires only occasional brushing to remove dead hair from their coats and to keep them sleek. However, facial wrinkles must be cleaned and dried daily to prevent infections. Families with allergies should be aware that shedding occurs throughout the year. Diet & Exercise – As with all dogs, a portioned diet is recommended to mimimize the tendency these dogs have toward overeating. The exercise requirements are relatively low with this breed, as they are remarkably active indoors. These dogs enjoy long walks. Health – This breed is known for breathing problems and tends to wheeze and snore. Health problems to look for include encephalitis, Less-Perthes, progressive retinal atrophy (PRA), epilepsy, entropion, liver problems, cataracts and sensitivity to drugs. Pugs are eager to please, but can be very headstrong. These dogs require dog training that is fun, as they bore easily. Consistency is a must, as this breed is one of the most difficult to train. Training is most efficient when started at an early age.